Dance, along with music, has always dynamically expressed the spirit and personality of every culture. Modern western dance is part of this global language and its roots run wide and deep. 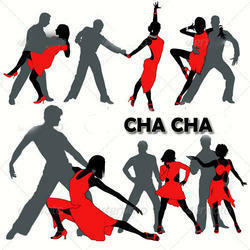 The cha-cha-cha, or simply cha-cha, is the name of a dance of Cuban origin. Cha Cha Cha is a true latin dance. Originating in Cuba, it developed from the danzon, an older form of Cuban dance. Students Are Taught Hip Hop, Jass, Balley, Cine Style, Semi Classical, Folk, Bollywood, Kollywood And So On. Students Should Be More Than 3.5 Years. Classes Are On Mondays, Wednesdays And Fridays At Keelkattalai And Tuesdays, Thursdays And Saturdays At Nanganallur Branch. As always we have served you the best in all the dance forms, so as belly dance too. Twist N Turns in assocition with Banjara School of Dance (Delhi) has already done few workshops and now regular course in Kolkata. We do this Belly Dance training in short course format. Please calls us for detailed understanding of the course and structures. - Dancing allows you to express yourself. - Dancing gives physical/mental refreshment and relaxation. - Dancing is a form of exercise. - Dancers find inspiration and motivation as they become lost in the dance. Khaitan Public School believes in diversity, and thus we lay emphasis on all forms of dances. We teach western dance, or Bollywood dance, which includes Jazz, Hip Hop, Contemporary, and Ballet to our students from all 3 wings. Our majestic dance instructors bring in pure joy, and playful activities when teaching different forms of Western Dance to their students.